Jared Unzipped: My Favorite Video Games: Ogre Battle. I'd like to focus on an absolute classic title from the 16-bit era of gaming. 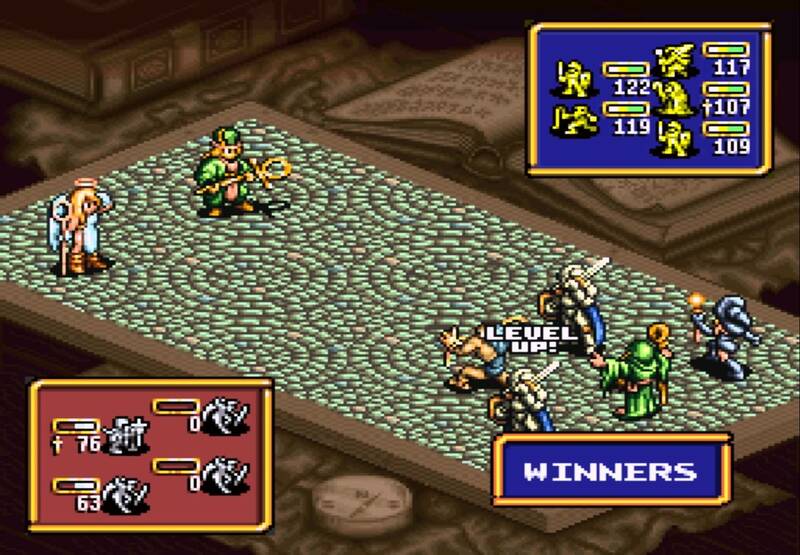 Released on the Super Nintendo in 1993, Ogre Battle is a real time strategy role playing game developed by Quest (now a part of Square Enix). 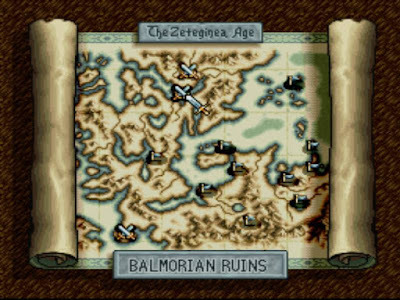 Ogre Battle is set in the vast world of the Zeteginan Empire. 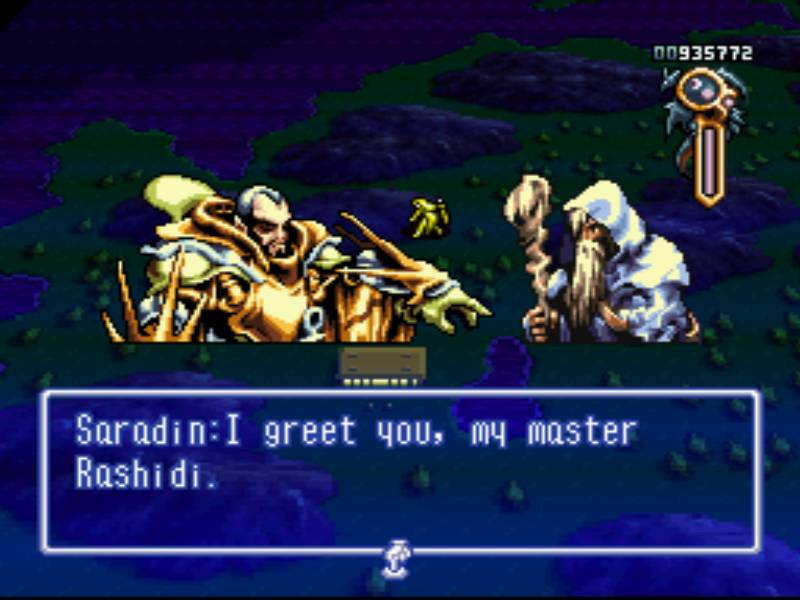 Taking control of a small army leading an uprising, the goal of the game is to combat the evil empire and defeat the devilish mage Rashidi. The general plot of Ogre Battle is your standard fantasy, sword-and-sorcery fare. What makes it absolutely incredible is the game play, where nearly every aspect of your army is customizable. You begin the game by answering a series of six questions. Each question provides three different answers to choose from. What's key here is that your responses influence what kind of leader you'll be. The various answers alter the leader's individual stats, as well as what kind of units are present in your initial army. The questions are presented to you as tarot cards drawn from a deck. 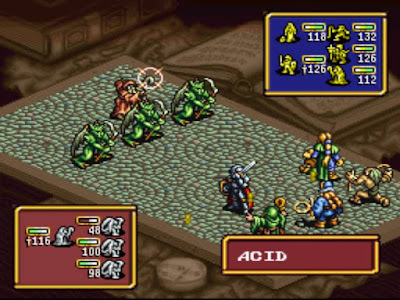 This element is important, as tarot cards play a lasting role over the course of Ogre Battle. After the opening sequence is complete, you command your army as it moves from one battle to the next. There are twenty-five stages, with five extra stages that are optional. Each stage presents a large battlefield spread over a continent. There are various towns and temples scattered throughout the stages, which your army can liberate from the opposing force. As your various army units move around the field, they will come into direct conflict with units from the enemy. During these confrontations, you can change the battle tactic for your unit -- attack the leader, the weakest character, the strongest character or the best character. 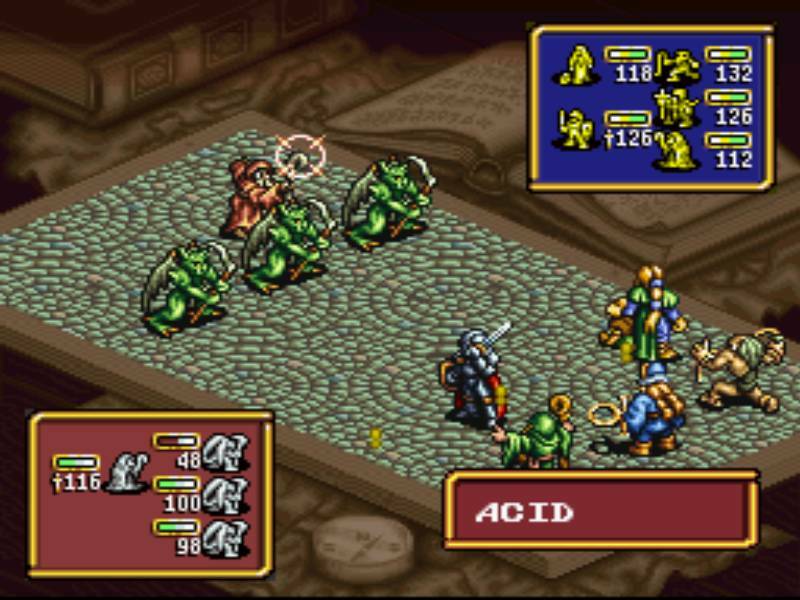 Eventually, your units will combat the boss of the stage, whom has their own specialized unit that's usually tricky to defeat. 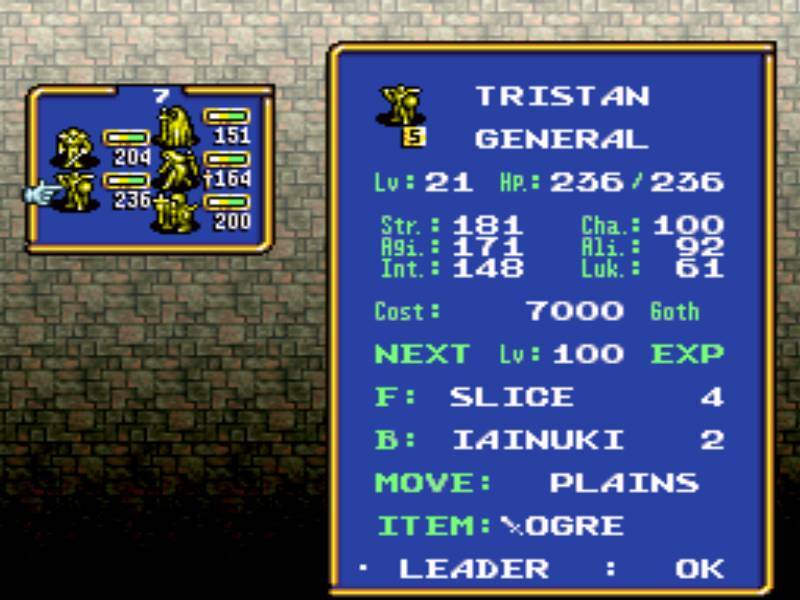 Units are totally customizable in Ogre Battle. They can be a team of up to five characters, though the use of large monsters like wyrms or gryphons will take up two character spaces instead of one. Characters develop their statistics over time with each fight, win or lose. Even better is their ability to be promoted. Lowly characters at the start of the game can eventually become quite powerful through battle experience, with the ability to lead their own units if you so decide. For example, a generic fighter can evolve into a knight, samurai or sorcerer. There's also the option for becoming a legendary creature like a vampire or werewolf if certain requirements are met. Over seventy-five different character types are within the game, meaning there's a multitude of various unit combinations you can build. Besides humanoid characters, there's also strange soldiers like demons, pumpkinheads, angels, mermaids and zombies. The possibilities are limitless! Remember I mentioned earlier how tarot cards have an overarching influence on the game? Every time you liberate a location, you draw a card. There are twenty-two different tarot cards in the game. Each card has a different influence on your stats. For example, the Fortune card randomly raises or lowers the Reputation stat. The Judgment card raises the hit point stat by two. Over the course of the game, each card drawn slowly alters the development of the characters in your units, yourself included. Yet, that's not the only benefit (or detriment) of the tarot cards. You get to keep each tarot card you draw, up to a maximum of fourteen. 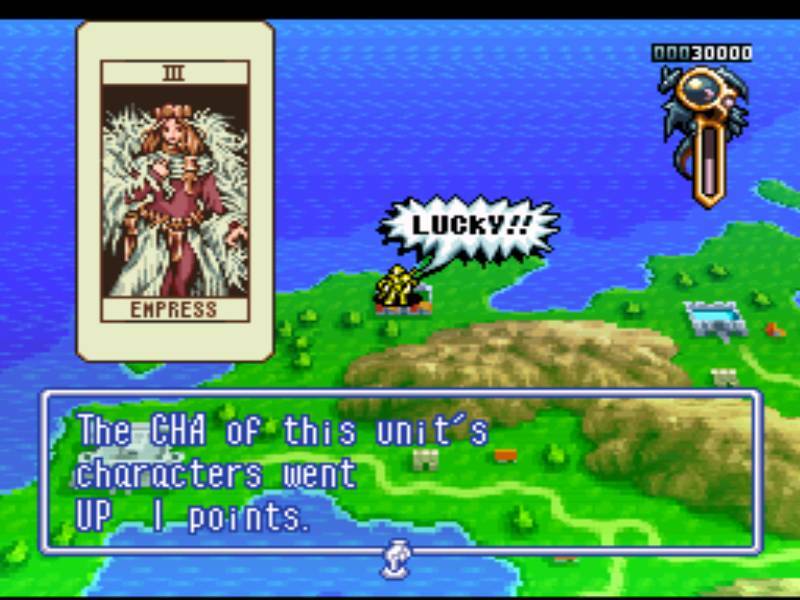 During battles between units, you may use a tarot card to influence the fight. Some cards will deal damage against your opponent. Other cards will cause the enemy unit to flee from the battle. The twenty-two cards each have a different capability, so you must use them wisely. Other elements of the game also impact the customization factor, like equipping weapons, character-unique terrain speed (flying, crossing water, moving over mountains, etc. ), and recruiting special characters in various stages. There are simply so many choices to make in Ogre Battle, I'd need an entire website just to explain them all! Also, I shouldn't forget to mention the very colorful and attractive graphics. The characters look great when you have unit battles, with unique animations for every character action. The soundtrack is also catchy and memorable -- I often catch myself humming the battle theme at random! 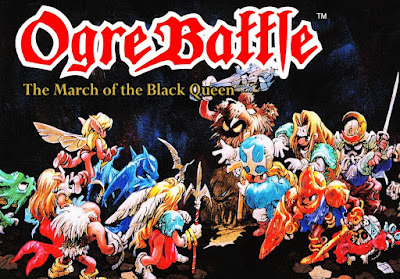 I first encountered Ogre Battle in high school a couple of years after it was released. I borrowed it from a classmate and played it for a few months before reluctantly returning it. For years, I searched high and low to find a copy of my own, with no luck. I completed the game several times in ROM format on my PC. Thankfully, I eventually found a physical copy and added it to my SNES game collection. 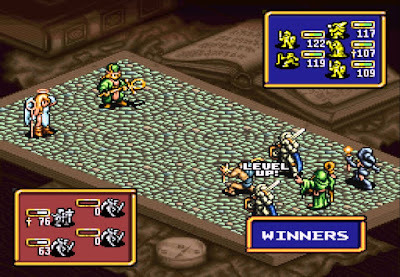 Ogre Battle truly is a standout title that any fan of strategy or role playing games should experience. I would never trade or sell my copy away -- it's just that good! If you're looking to acquire the original SNES cartridge on the internet, expect to pay around $100 USD (as of the time of this writing). Enix, the North American distributor of Ogre Battle, only printed 25,000 copies of the game. It is fairly hard to locate a copy, but they are out there. 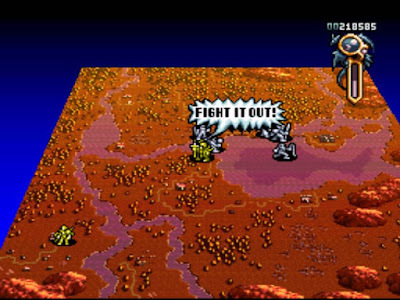 Ogre Battle was also released on the original PlayStation console, which currently sells in the $50 - $75 range on the internet. 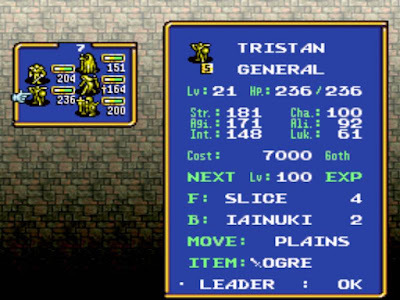 For a much cheaper alternative, you can download Ogre Battle via the Nintendo Wii Virtual Console for less than $10! 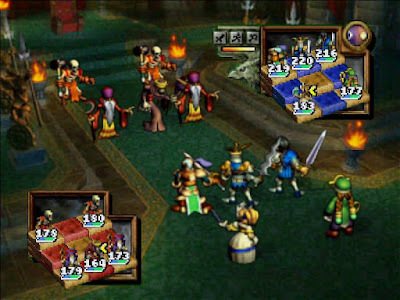 Of note, a fantastic sequel was released for the Nintendo 64 called Ogre Battle 64. It's just as customizable and features improved graphics. I only favor the original game because of the nostalgia factor and the novel use of tarot cards. Now get out there and lead a revolution!